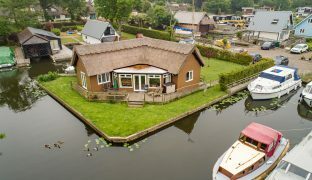 A beautifully presented four bedroom detached waterside cottage set in a sought after and picturesque location with views of the River Bure and a generous double length mooring, all within easy walking distance of the centre of Horning. 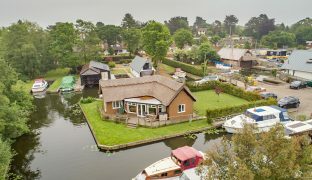 A beautifully presented four bedroom detached waterside cottage set in a sought after and picturesque location within sight of the River Bure and easy walking distance of the centre of Horning. 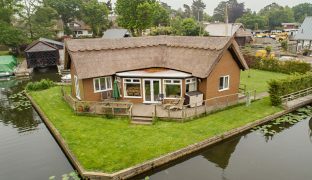 Of timber construction under low maintenance cladding beneath a recently replaced thatched roof, this deceptive property successfully combines the charm and character of a period property with style and standards of finish of a contemporary home. 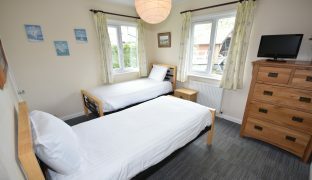 The accommodation consists of a kitchen, open plan to a generous living room, master bedroom with en-suite shower room, three further double bedrooms and a large four piece bathroom. 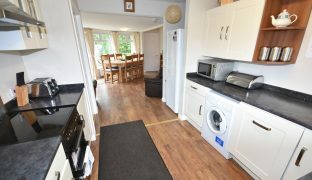 Features include full UPVC sealed unit double glazing, LPG central heating, well enclosed south facing garden with private parking for three cars. 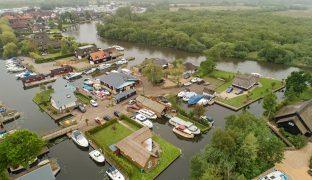 The property also offers approximately 150ft of private quay heading including a generous double length mooring measuring approximately 90ft x 13ft. 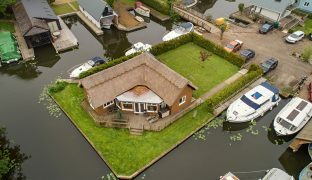 Part of this mooring could easily be used independently of the main property if its current use as a well established holiday let was to be continued. 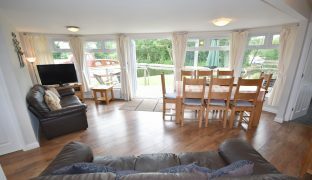 With impressive views out over the water along the dyke to the River Bure beyond, the property is equally suitable as a main residence, a well placed second home or as an already successful holiday let, with contents available by separate negotiation. 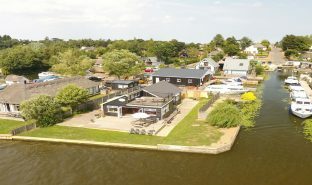 Set within approximately half a mile from the centre of Horning, one of the Broads’ most sought after villages, served by a wealth of local amenities including three riverside pubs, two restaurants, deli, coffee shop, village store, Post Office, butchers and a number of boatyards/boat hire businesses. 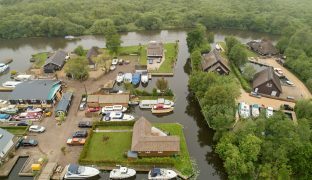 The village sits on the River Bure, which gives access to the entire Norfolk Broads network. Early viewing recommended. 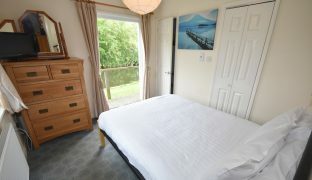 Picture windows looking out over the water to the river beyond. 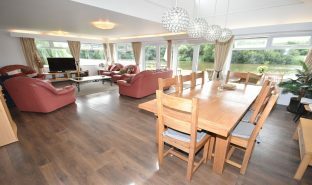 French doors leading out onto a raised sun deck, two radiators, laminate flooring. 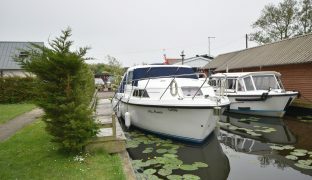 Dual aspect with impressive views looking down the dyke to the River Bure beyond. 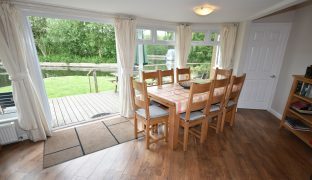 French doors out onto raised decking. 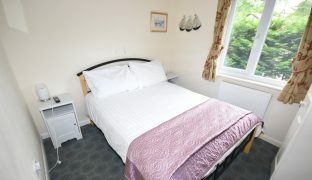 Radiator, panelled door, built in wardrobe, TV point. Shower enclosure with folding door, hand basin, low level w/c, towel rail, down lighter and extractor fan. 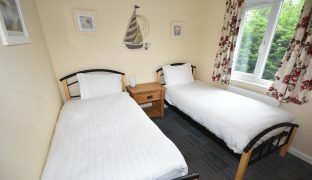 Dual aspect with views out over the moorings. Radiator, built in wardrobe, panelled door. 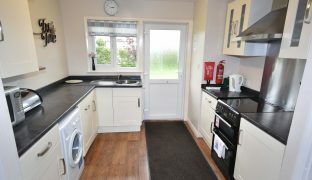 Window to rear, radiator, built in wardrobe, panelled door. 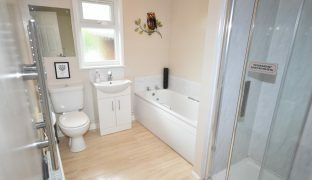 Four piece suite comprising a low level w/c, vanity wash basin, panelled bath, large shower enclosure, radiator, heated towel rail, laminate flooring, built in boiler cupboard, panelled door. 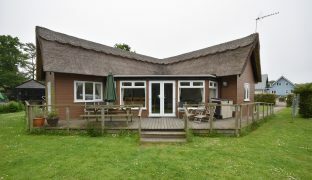 The property occupies a generous corner plot with water on two sides and impressive views along the dyke down to the River Bure beyond. 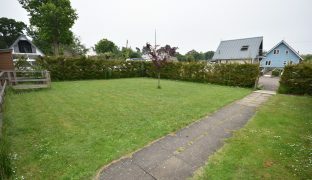 The enclosed, south facing garden is mainly laid to lawn with raised decking wrapped along the property leading to a large sun deck looking out over the water. 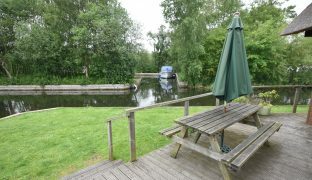 The property benefits from outside lighting, power and water, a garden shed and private off road parking for three cars. 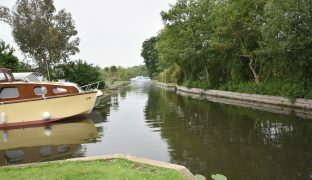 The total quay heading extends to approximately 150ft, which includes a double length mooring measuring approximately 90ft x 13ft with shore power. 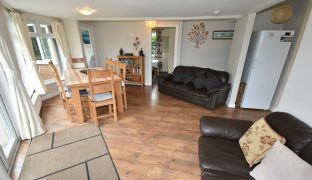 Full residential status, currently run as a holiday let with bookings in place for the coming season, contents available by separate negotiation. 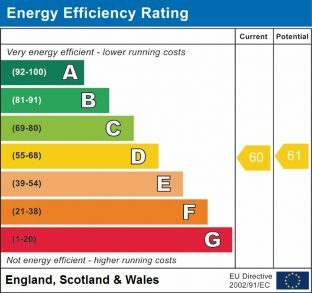 Services: Mains electricity, water, drainage (pumped), LPG central heating. Access: via a private roadway and bridge. Annual service charge tbc.